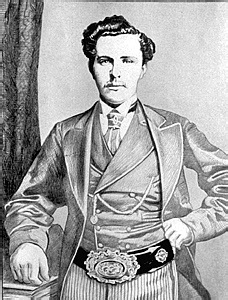 Young Tom Morris wearing The Champion’s Belt — the original prize for Open Championship winners. The oldest of golf’s majors, the Open Championship extends back to 1860, when it was played by eight professionals at Prestwick Golf Club. The initial winner was Willie Park, Sr. He defeated the heavily favored “Old” Tom Morris by two strokes. Harry Vardon holds the record for the most number of victories, with six. Winners of the Open Championship originally received “The Champion’s Belt.” Later, the trophy became the famed Claret Jug. The complete list of British Open Championship winners is below. A = amateur PO = Playoff, a number in parenthesis following a name indicates the number of Open Championships that player had won at that point. In 1953 Ben Hogan took home $5,000 for winning the US Open. At the time, a British Pound was worth $2.80 so by comparison, Ben only received $1,400 for winning the Open. In 1971, Lee Trevino won $30,000 as the US Open champion. That same year Lee’s win at the Open paid the equivalent of $13,200 (a pound was the approx. equivalent of $2.40 that year). Graeme McDowell took home $1,350,000 for his win this year. At $1.52 per pound, the Open winner will receive the equivalent of $1,140,000. Just shows how much things having changed money wise when it comes to golf. The British open is probably the most sort after major given that is played at the home of golf. Very difficult to pick a winner this year as there are so many chances. I’ll come up with my top four in the next 2 days. The thing that sticks out in my mind right now with this article and golf is how will the Americans do in this Open Championship. I feel a little competitive about it. The top players in the world right now are Europeans. They have played the best and deserve it. The course they are playing at will require a great deal of mental toughness. I am looking forward to see how it plays out. It will be a true test for all participants and I am glad of that. In the past of The Open Championship, various grants have already been given away for several successes. A few of these include the Challenge Belt, The Gold Medal, The Silver Medal, and also the Bronze Medal. At this time probably the most precious medal is the Claret Jug. Additionally referred to as Golf Champion Trophy, it changed the Challenge Belt and may be awarded towards the champion every year since 1873. Ernie Els should have a (2) after his name in 2012. He first won in 2002.